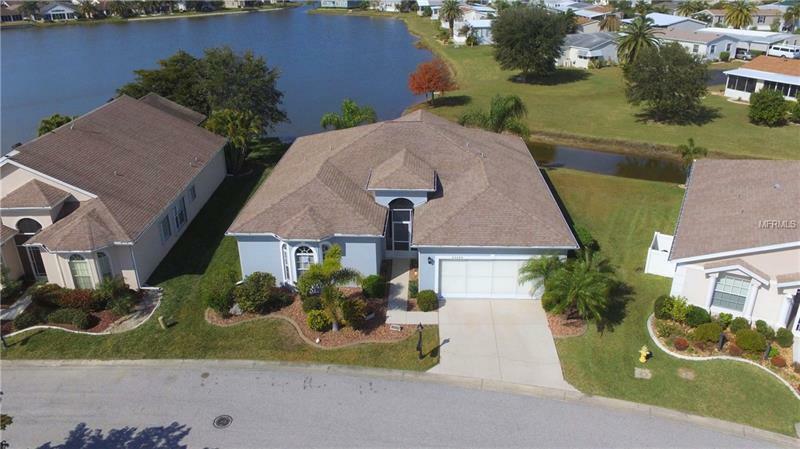 Spacious and impressive Eaton model with over 2000 sq ft of living space overlooking lake in Kings Gate a popular 55+ gated golf course community with resort style amenities. Watch the beautiful sunsets from your expanded 289sq ft screened lanai. Floor plan includes three large bedrooms 2 bathrooms living room family room/dining room combination open concept kitchen inside utility room and two car garage. Master bedroom with en-suite bath offers sliding glass doors out to the lanai two walk-in closets dual vanity soaking tub and walk-in shower. Guest bath features walk-in shower. Fully furnished. 11' ceilings throughout. Central Vacuum New AC in March 2015 New water heater Dec 2016. Exterior includes upgraded easy to close accordion style storm shutters. Drive your golf cart to shopping and dining. Not in a flood zone and no CDD tax. Easy access to I75 via exit 170 Kings Highway. Great location short distance to all that southwest Florida has to offer. Monthly fee includes basic cable tv lawn maintenance and more. Appointment required 24hr gated entry.